1. How to make a copy of your Kanban card? Press the "Ctrl key" and drag and drop the card to the desired position on the Board. A copy of the card will be created at the selected position. In case that you want to move the card to a different board -> use the card Context menu -> select "Move to" and define the desired board from the Board menu. Right click on the card to open the Context menu → select Link/Copy → Simple copy. The system will automatically create a copy within the same board and column, where the original card is hosted. 2. Preserve the Parent/Child relation when copying a child card? 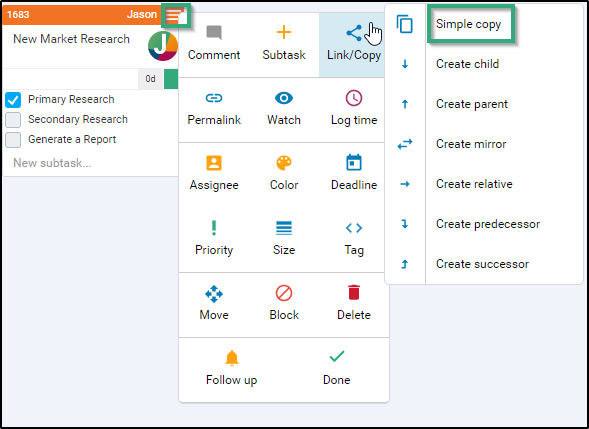 When you create a simple copy of a child card (by drag & drop), the parent-child relationship will be preserved. The parent of the original child card will automatically become a parent of the new/copied card.